Yesterday evening(February 10th) Jennifer Lopez, Tracee Ellis Ross and Anna Kendrick wore RALPH & RUSSO SPRING 2019 COUTURE to the 61st Annual Grammys Awards at the Staples Center in LA. Jennifer Lopez who performed at the event, rocked a sleeveless mint embellished, floor gazing dress, with the matching wide brim hat. JLo is known for rocking hats and she wears them very well and this time was no different. However the fit of the dress could have been better. 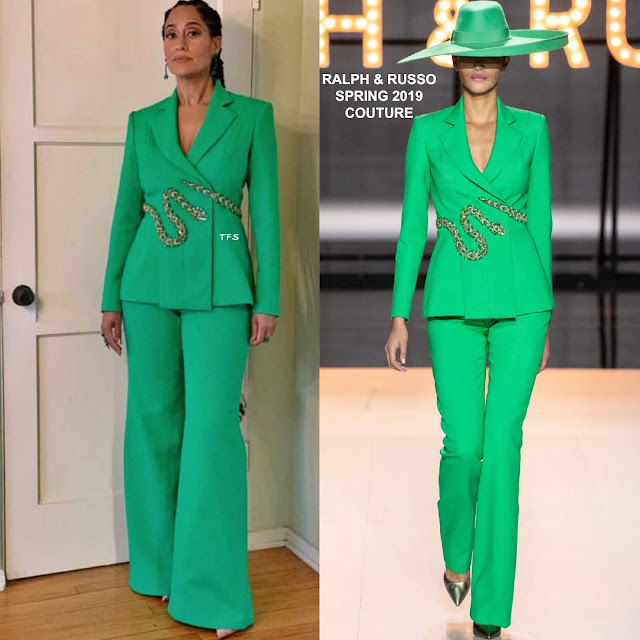 Tracee Ellis Ross definitely delivered in this green power suit which featured a snake embellished blazer and wide-leg trousers. I would have liked to see this with the hat but I am here for her look either way. Her look was accessorized with LORRAINE SCHWARTZ jewelry and CHRISTIAN LOUBOUTIN pumps topped off her look along with long cornrows. Anna Kendrick wore a strapless pink feather embellish mini dress, which was accessorized in a silver metallic clutch and STUART WIETZMAN sandals. I feel like I have seen Anna in something like this before but it definitely a playful piece that suits her.